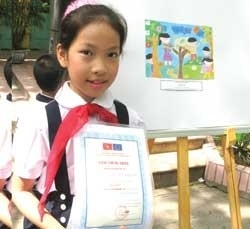 A budding artist from Hanoi\'s Hoang Dieu Primary School has received the top prize in the Vietnamese section of a drawing contest organised by the Delegation of the European Union (EU) to raise awareness of gender equality issues. Nguyen Phan Nguyet Minh received the award for her painting of a game of blind man\'s bluff during an awards ceremony held in Hanoi. Minh\'s drawing will now be sent to the headquarters of the European Commission in Brussels where a jury of European children will select two drawings from each participating region. A prize worth EUR1,000 (USD1,400) will be awarded to two winners from each participating region. Local judges had received 4,000 entries from children throughout the country since the competition was organised two months ago, according to Vu Quang Vinh, editor-in-chief of Thieu Nien Tien Phong newspaper, the competition\'s co-organiser. "The paintings covered a range of genres and used different materials, portraying the subject through depictions of as study, work and play," he said. "All the paintings testified to the creativity, enthusiasm and support for the concept of gender equality in the spirit of the children," said Juan Jose Almagro, a representative of the EU Delegation.